The Prime Minister Narendra Modi with the President of the Socialist Republic of Vietnam, Tran Dai Quang, at Hyderabad House, in New Delhi on March 3, 2018. 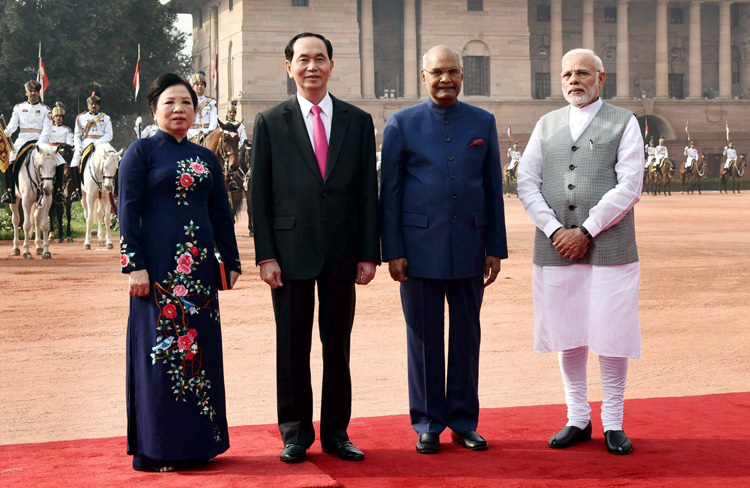 The three day visit (March 2-4) this year by Vietnamese President Tran Dai Quang’s was testament to the growing closeness in the bilateral security ties between India and Vietnam. His visit came just few weeks after Vietnamese Prime Minister Nguyen Xuan Phuc’s visit to India as chief guest at India’s Republic Day Parade 2016 along with heads of states of all other ASEAN countries. Vietnam is an important pillar in India’s ‘Act East Policy’. 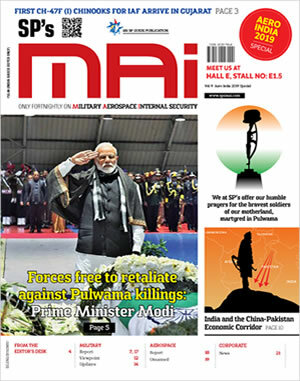 India’s engagement with Vietnam was elevated to ‘comprehensive strategic’ level during the visit of Prime Minister Narendra Modi in 2016. There is also an institutional mechanism of Foreign Office consultation and strategic dialogue between the two countries. The Indo-Vietnamese relationship holds special significance in face of China’s growing assertiveness. It may be recalled that China had invaded Vietnam in 1979 to “teach Vietnam a lesson” and presently Chinese activity along the Line of Control (LoC) with India is increasing while China has built up a brigade-sized force in Doklam Plateau of Bhutan. Both India and Vietnam have unresolved disputes with China and have been subjected to aggressive Chinese tactics. Vietnam is one of the handful of countries in Southeast Asia that has stood up to Chinese pressure to some extent. It may be recalled that in response to China’s aggressive posturing in the South China Sea (SCS), Vietnam has called on India to play a more proactive role in Southeast Asia. President Quang first landed at Bodh Gaya in Bihar for pilgrimage to the Mahabodhi Temple, enroute to New Delhi. 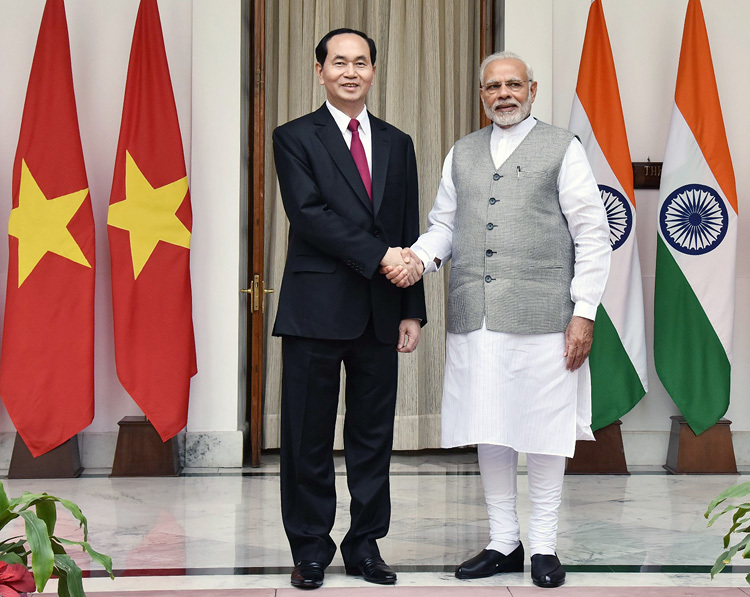 Quang’s visit marked 45 years of India-Vietnam diplomatic relations and was centered on deepening the Comprehensive Strategic Partnership between the two countries. During the visit, President Quabg hel talks with President Ram Nath Kovind, delegation-level talks with Prme Minister Narendra Modi, besides meeting EAM Sushma Swaraj and other leaders. He also addressed the Vietnam-India Business Forum and held discussions with several prominent leaders of industry and business. Three, MoU, for strengthening technical cooperation in atomic energy for peaceful use. The President Ram Nath Kovind and the Prime Minister Narendra Modi with the President of the Socialist Republic of Vietnam, Tran Dai Quang, at the Ceremonial Reception, at Rashtrapati Bhavan, in New Delhi on March 3, 2018. Both sides agreed to hold the next Joint Committee Meeting during 2018 to review cooperation and implementation of the Action Plan for the Comprehensive Strategic Partnership for period 2017-2020. The welcomed ongoing exchanges in defence and security, reaffirming commitment to open, free, seure, stable peaceful and accessible cyber space under aegis of UN and initiating dialogue for enhancing cooperation in traditional and non-traditional security matters. Both unequivocally condemned terrorism in all its forms and reiterated importance of and adherence to international law, especially the United Nations Convention on the Law of the Sea (UNCLOS), in settling the South China Sea issue. Both sides agreed to expedite US$100 million Line of Credit for building high speed patrol boats for Vietnam Border Guards and early signing of framework agreement for US$500 million Line of Credit for defence industry. India-Vietnam trade stood at $6.24 billion in fiscal 2016-17 and the two sides have agreed to raise this to $15 billion by 2020. Though Vietnam-China bilateral trade is around $70 billion, India’s market size and Vietnam’s rapidly rising economic has the potential to boost India-Vietnam Strategic Partnership. India has been training the Vietnamese military in operating its Russian-built Kilo-class submarines and Sukhoi-30 fighter jets. Ship visits and supply of military spares, maintenance of hardware are also important facets of defence cooperation. In recent past, Indian and Vietnamese engaged in joint patrols, and both navies participated in a joint exercise. India has also repaired and upgraded over 100 MiG fighter aircraft of the Vietnam Air Force and supplied them with enhanced avionics and radar systems. Both sides also have an MoU on collaboration between Coast Guards of both countries. There have been reports in the past about India exporting BrahMos cruise missiles to Vietnam, but some other reports indicate Russia being joint production partner is hindering the sale because of the China-Russia relationship. In addition to India extending Lines of Credit to Vietnam, Vietnam is also among the larger recipients of scholarships offered under the Indian Technical and Economic Cooperation (ITEC) program. Vietnam is an important partner in southeast Asia and is currently the country coordinator for India with the ASEAN regional bloc. Apart from ASEAN, India and Vietnam closely cooperate in other regional forums such as the East Asia Summit, Mekong Ganga Cooperation and Asia Europe Meeting (ASEM), in addition to cooperating at the UN and WTO. Defence has emerged as an important pillar of the bilateral relationship, which will continue to deepen given the fact that by all indications China’s aggression will keep growing with the ambition of becoming a ‘Great Power’ in the shortest possible timeframe.